Providing compassionate representation in all probate matters. Making a difficult process as seamless as possible. The legal process of ending the business of one’s life. The process of collecting your assets, paying your debts and distributing your estate. Probate is the legal process of administering one’s Estate. If there is a Will then the contents are the decedent’s directions and wishes for disposal of the estate. 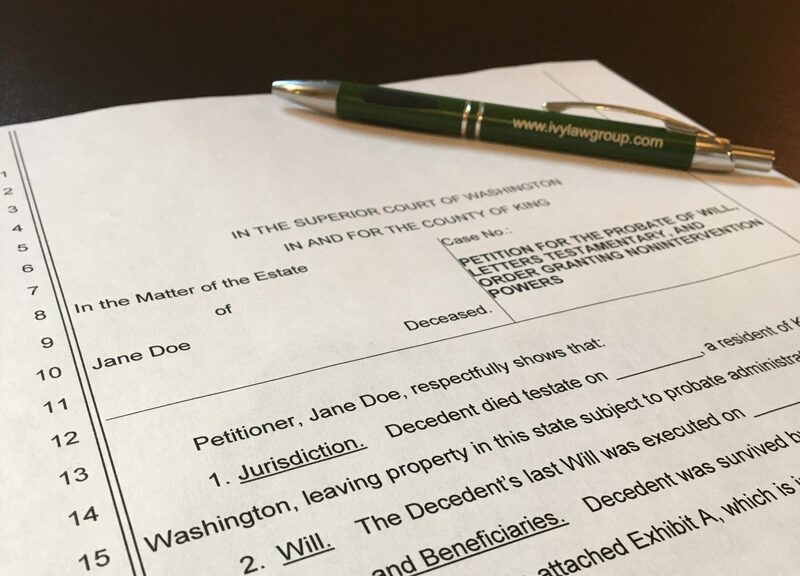 If there is not a Will then the State of Washington laws of Intestacy apply and direct the disposal of the estate. At Ivy Law Group we guide you through the entire process of probating an estate. People often fear and seek to avoid probate but in Washington, it is a fairly smooth process and has several benefits. It creates finality for the financial obligations of the decedent including protecting the heirs from unknown debtors. Probate is also a good tool for prevention of identity theft of the decedent. The person who manages the probate is called the Personal Representative, or the Executor. The titles are interchangeable with Personal Representative as the more modern term. The Personal Representative is named in the Will, or if there is no Will then is named by the Court. Keeping accurate and detailed records, staying on top of deadlines, and following legal procedures all while dealing with grief associated with the death of a loved one is a lot to tackle. A good attorney will help with all of this. We take an efficient and compassionate approach addressing both the legal and emotional aspects associated with probate. Determine if the deceased desired a cremation or burial and arrange the service. Locate the Will, if the deceased had a Will. Determine what your role will be in distributing the deceased’s estate. Contact Ivy Law Group and consult with an attorney to get an idea of what your legal responsibilities entail and how we can help you accomplish them. Look for a Survivor’s Manual written by the deceased with the deceased’s personal and financial information. Identify your support systems and take care of yourself. Petition the court to open the probate and appoint the Personal representative. Because our case was for an unrelated estate executor it was a challenge for us. Ivy Law Group guided me through with great assistance and explanation. They were available and very professional. I much appreciate being a client.